China is doubling down on Pakistan – and this time, it’s determined to keep militancy from damaging the relationship. Chinese General Zhang Youxia, vice chairman of China’s Central Military Commission (CMC), chose to describe military cooperation as the “backbone” of China-Pakistan relations in a meeting with the Pakistani Army Chief Qamar Javed Bajwa in September 2018. Security cooperation has become an increasingly important aspect of China’s some $62 billion investments in Pakistan, made under the umbrella of the China-Pakistan Economic Corridor (CPEC), a flagship of China’s Belt and Road Initiative (BRI). Chinese workers and infrastructure face a continuous threat of attacks by militant groups on Pakistani territory. In just two years after the 2015 launch of CPEC, militants had killed 44 workers on related projects and injured more than 100. The Pakistanis have thus made vast efforts to secure the Chinese. 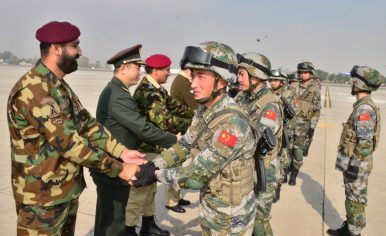 Countering militant groups has become a fundamental part of Sino-Pakistani security cooperation at the bilateral, regional, and international levels. Despite Chinese security reports deeming several projects under CPEC to be at serious risk of failure, and the continuous risk of militant attacks, both the Chinese and Pakistanis have been pushing forward wherever progress and cooperation is possible. It has not always been like this. The militancy challenge in relations appeared in the 1990s, as violent cross-border links emerged between exiled and radicalized Chinese Muslim Uyghurs residing in Pakistan and separatist Uyghurs in China’s autonomous region of Xinjiang. Additionally, a security threat from China-hostile separatist and sectarian militants on Pakistani territory emerged in Balochistan in 2004, and thereafter in what was formerly known as the Federally Administered Tribal Areas (FATA), Khyber Pakhtunkhwa, Punjab, and Sindh. While some of the attacks were motivated by ideas of jihadism and support of the Uyghur cause, Baloch separatists accounted for the largest challenge. In the early 2000s, nowhere in the world was a Chinese worker more at risk of falling victim to militant attacks than in Pakistan. Sino-Pakistan relations suffered more than 20 militant attacks in the years 2004-2017. The Chinese grew increasingly concerned about the possibility of violent extremism spilling over from South and Central Asia into Xinjiang. The militants apparently had a strong card available to drive a wedge in China-Pakistan relations. Chinese workers pulled out from the most risky areas of Pakistan and infrastructure projects were cancelled in Balochistan. The actions of China-hostile militants on Pakistani territory provoked public reactions from China and Pakistan, in an otherwise non-transparent relationship. China’s first public reprimand of Pakistan was in reaction to a militant attack in the mid 2000s, when Beijing demanded enhanced security for expats. Transnational militancy had such a deteriorating impact on bilateral relations that it was seen as damaging for the prospects of the China-Pakistan Economic Corridor, despite of their professed all-weather friendship. Yet, China is back in and this time much more is at stake for both China and Pakistan. If China succeeds in implementing the vast infrastructure corridor in a hazardous landscape, it will prove Beijing’s ability to implement the BRI. China will have achieved much more together with the Pakistanis than the United States ever did. For Pakistan, borrowing muscle from China provides incentives for focusing on stabilizing its struggling economy, poor energy grid situation, domestic security, and leverage against its archrival India. India has permeated Pakistan’s foreign and security policies since Pakistan’s conception, and the threat posed by India was what first brought China and Pakistan together more than six decades ago. With the aim to secure Chinese-built infrastructure and Chinese workers in Pakistan, the two neighboring states have initiated a concerted security force consisting of the army, navy, paramilitary forces, and private security companies. The last is particularly interesting, as it is a low-profile and unregulated way of introducing Chinese security support abroad. Chinese private security companies have formed joint ventures with local Pakistani companies linked with the Pakistani armed forces. For instance, the Chinese Overseas Security Group has seemingly forged a joint venture with a Pakistani private security company with links to the Pakistan Navy. As the Pakistanis provide China with confined economic zones with an enhanced security organization, one may see an increased presence of Chinese private security companies on Pakistani territory. This scenario may become even more likely if the risk of militancy increases. At the regional and international levels, China has led an inclusive policy regarding Islamabad even when India and elements within the United States have sought to list Pakistan as a state that sponsors terrorism. China has been blocking bids in the United Nations to blacklist Masood Azhar, the founder and leader of the India-hostile terrorist group Jaish-e-Mohammad, as an international terrorist. Azhar resides on Pakistani territory, and his group’s alleged actions have brought Pakistan and India to the brink of war. Jaish-e-Mohammad has also targeted Pakistani military installations. The fact that the militants threatening CPEC are a threat to both China and Pakistan facilitates countermilitancy cooperation. Despite the tensions created by militancy, the neighbors’ prior bond provides a shorter path to expanding mutually beneficial ties, as more options are already on the table compared to what is generally the case in a highly conflict-prone relationship. China and Pakistan have served as the most stable element in each other’s foreign relations. Strategic interests and decades of building elaborate communication channels have outweighed the divergence in their state ideologies and lack of cultural links. Besides, China views Pakistan as part of the solution to regional militancy rather than a mere breeding ground of such militants, which may give China more leverage to persuade Pakistan to transform its countermilitancy strategy, beyond securing joint projects. And undoubtedly, there is more security to gain for both states from joining forces than from conflict, considering their overarching strategic priorities. In order to implement CPEC efficiently, China needs Pakistan to ensure the security of its workers and infrastructure and fight militancy. The Chinese have adapted their policies to the risk of militancy. They stand unique in their ability to build lasting bonds across the fragmented Pakistani leadership and other powerful groups, including opposition parties with links to militants, which indicates a growing capacity to manage political factionalism in Pakistan. In building up Pakistan’s infrastructure, economy and connectivity, as well as increasing its strategic importance, China could, in the best case, help build Pakistan’s confidence and partly free it from its preoccupation with the Indian threat. For Pakistan, this has been a main incentive for grooming selected militants. It is clear that China has a better chance of inspiring the Pakistanis to alter their countermilitancy policies than the United States ever had. American attempts at compelling Pakistan to take up arms against specific militant groups failed, mainly because U.S. interests clashed with Pakistani domestic security calculations and principal security interests, which boil down to building ever stronger leverage vis-à-vis India. The price Washington paid for the deterioration of relations with Islamabad and Rawalpindi after 2011 was that of no return. Viewed from Pakistan, it was the third serious betrayal from the Americans throughout history. The consequences are more distinct bloc formation in the region, as China and Pakistan have become more inseparable, and the United States has focused increasingly on warming its relations with India. Willingly or not, CPEC and enhanced Sino-Pakistani countermilitancy cooperation signal a new geopolitical reality, and the dynamics in the region cannot adequately be understood without understanding the management of transnational militancy. This article is a shorter-form version of a research paper published in The Pacific Review, a journal focused on the international interactions of the countries of the Pacific Basin. The Pacific Review covers transnational political, security, military, economic and cultural exchanges in seeking greater understanding of the region. Saira H. Basit is Associate Professor at the Norwegian Institute for Defence Studies and Vice Dean at the Norwegian Defence University College. A recent article by the author on a related theme is Basit, MacFarlane & Torjesen, “China in Pakistan and the wider region: A cautious but effective leader?” Contemporary South Asia, 2019.